Fallow deer are native to Europe, in the Mediterranean region and can be white, spotted, brown or reddish-brown with white spots. 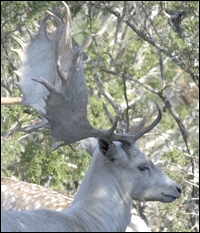 In the fall, the males have hard antlers with wide flat palmations. They are apt to develop 20-30 points and weigh up to 200 pounds, while females weigh around 100 pounds. Opportune hunting time for Fallow deer is August through March, and they are not affected by hot or cold weather.